NIA Charlestown Nevis – Premier of Nevis and Minister of Education in the Nevis Island Administration (NIA) Hon. 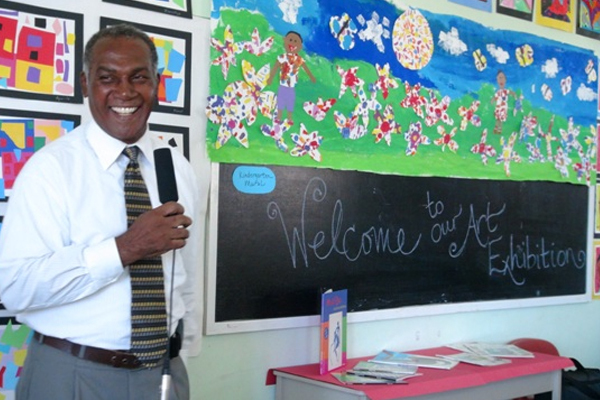 Vance Amory, while he delivered remarks at a brief opening ceremony of an Art exhibition at the Elizabeth Pemberton Primary School (EPPS) on March 07, 2014, encouraged the students to use art as a method of showcasing their artistic talents. The exhibition was part of a month-long art programme organized by certified Art teachers Sandra Thoms and Catherine Cobb of the Glen Urquhart School in Massachusetts. The teachers donated art supplies to the EPPS and the Joycelyn Liburd Primary School and educated the students on a variety of art techniques. During a brief ceremony, Mr. Amory regarded the programme as step in the right direction which would assist the students to express themselves in a productive manner. “I know that this is just another step in what, I believe, is going to be a very productive developmental issue identifying those of our children who have talent as artists. Someday, who knows, one of them or many of them could become the new Picasso or the new Michael Angelo and become well known [and] become millionaires because every work of art has value. “I believe our children are multi-talented…I have undying faith in our children. I know and believe that they can excel in anything which they put their hearts to and we just have to give them the opportunity. Give them the encouragement. Give them the positive reinforcement and give them the kind of guidance which will ensure that they can develop whatever skills they have,” he said. Mr. Amory encouraged the Department of Education to consider training art teachers, to ensure the programme’s longevity. “I want to throw out something else to our Education Department and perhaps to myself, that we begin now to seek to have someone who is an Art teacher or a budding Art teacher develop the skills and have Mrs. Thoms and Mrs. Cobb work with them to develop their skills, so they too can become…an Art teacher instructed by our two guests and developed by them to instruct our children,” he said. The Minister of Education also thanked the facilitators of the art programme for their commitment to educating the students about art. “I want to commend Mrs. Thoms and Mrs. Cobb for the effort and the time which you have spent with our children…I think much has been said about the Art work and I too want to say how very happy I am to see the products which the children have produced,” he said.